I have been working on this pumpkin bread recipe all day and I am so excited to share it with you. It is soft, moist, and absolutely delicious. This is the first time that I actually completely reworked, mixed, matched, and created my own baking recipe – I feel a little bit like a chemist. You see, I had a pumpkin bread recipe that I made for years, but I didn't love it. I just couldn't find a better alternative. Most of the recipes I came across had too much sugar or too much fat. So, my ambition finally kicked in and I decided to piece together a recipe that met my criteria. But my second try came out great – and this is the pumpkin bread recipe that I am sharing with you here. Add one egg and continue to beat on low until combined. In a separate bowl, mix the flour, baking powder, baking soda, and spices until combined. Alternately add the flour mixture and the water to the sugar mixture on low speed until combined. Pour the batter into a greased, nonstick, 9 inch bread pan and bake at 350 degrees F for about 50 minutes. Cool in the pan for a minute or two and then remove from pan onto a cooling rack . Wrap the part you don't eat tightly in aluminum foil and store in refrigerator. Make sure to grease the pan well. My pumpkin bread recipe stuck a little bit to the bottom of the pan – so I must not have done a very good job of it. If you have ever wondered about how baking powder works vs baking soda – I found a great explanation here at Sally's Baking Addiction. This article actually helped me a lot when formulating my pumpkin bread recipe. Baking soda needs an acidic element in the recipe to work properly whereas baking powder already has some acidity in the product. What I realized is that my old recipe (the one that didn't come out very good) had lots of baking soda in it – but no acidic element. So, I added acidity via the sour cream, slightly reduced the baking soda, and added in a little baking powder. Just in case you were interested …. Combine the sugar with oil and sour cream (my secret ingredient) in a mixer bowl and beat on low until combined. Pour the batter into a greased, nonstick, 9-inch bread pan and bake at 350 degrees F for about 50 minutes. Cool in the pan for a minute or two and then remove from pan onto a cooling rack. Wrap the part you don't eat tightly in aluminum foil and store in the refrigerator. One of the things I have been working on lately is improving my food photography. I am currently taking the Food Blogger Pro course and both my blogging and my photos have improved quite a bit. The doors only open a few times per year but you can click here to get on the waiting list and also download a few of their free materials which are pretty awesome too. You can also read my review of Food Blogger Pro here. 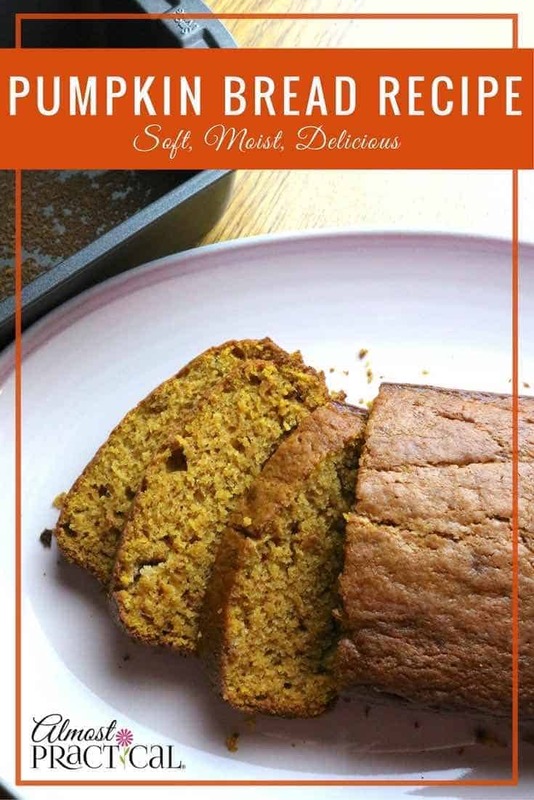 Do you have a great pumpkin bread recipe? What ingredients do you add that makes it a favorite? Love the recipie. Excited to try it. You do have the wrong form of “2” in your cooling instructions bbifnitnwaa me. I would want to know…. Oops – thanks for letting me know. Just changed it. I hope you enjoy the pumpkin bread recipe.